Ryan Balfour Racing :: 10 out of 10 and an A for effort ! 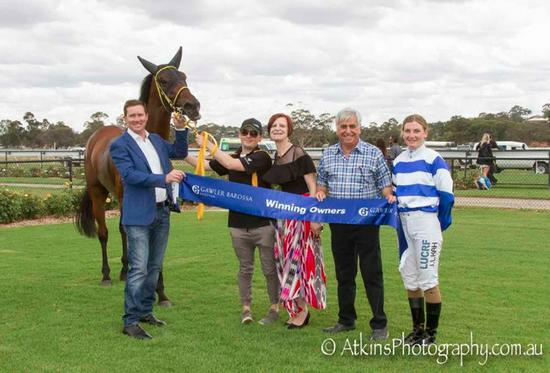 Aagas won his 10th career race at the Gawler 'Metropolitan' meeting on Saturday December 19th. The 7yo by Golden Snake is out of quality producer Brindabella and delivers on his best preparation yet with 3 wins and almost $100,000 in stakes this campaign. After the race, trainer Ryan Balfour said "It's a credit to the horse and the staff that he's had the prep that he has. He's a tough and consistent lad who just gets the job done every time. He's fit and happy and thanks to the work of my brother Todd a number of our horses get the time away from the track that they need by seeing the beach so often"
There's likely for more this campaign for Aagas as he was lowly weighted in Saturdays event and he can race against that class for a while yet.